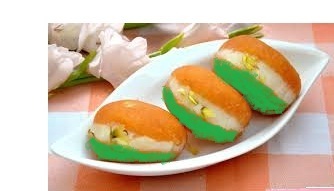 This Independence day I am going to share with you a dessert, called Tiranga Chum-Chum. First of all Happy Independence day to all of you. Chum-Chum is having in only one color as white. always brought us this tiranga chum-chum. 9. Almonds 5 cut into small thin pieces. 1. Firstly, we have to make paneer from milk. For that take a pan, put milk into it. Let it boil.2. Then take lemon juice into a small bowl, put 2 tsp water into this lemon juice. 3. Now pour this lemon juice into the boiled milk. Now make the flame slow. thick part collected at one side and water on another side. 5. Stir it continuously then milk gets broken. Then you can get a thick part collected at one side and water on another side. 6. Then switch off the flame, let cool down the milk. 7. When it gets cooled, then take strainer put into a big pan. Then put a thin cotton cloth spread on the strainer. 8. Pour all the broken milk into a cotton cloth. 9. Get down all the water into the pan and thick part of milk remains in the cloth. that all the water from it get strained. And hang it for half an hour. 11. After half an hour take this potli again on the strainer. Put a heavy weight on it. So that remaining water is also get removed from this potli. 12. After half hour open this potli take out all the paneer into s big plate. Mash it very well by your hand so that it becomes smooth in texture. mix it very well. Other parts remain as it is. take one ball press it just ones on your hand make all other balls like this one. Take one white colored ball then put this ball on one green colored ball. And press it so that it get sticked to each other. Make same with other balls. And keep them aside. 15. Now take khoya in a plate, mix saffron colour and powdered sugar into it. Mix it well. and make small equal balls of it as like paneer. And put it into the freeze for about half an hour. So it take a shape. have to make sugar syrup like gulab jamun we have to only get dissolve sugar into the water that's it don't make it like normal sugar syrup. our flattened two colored balls of paneer into this cooker and close the cooker by it's lead. and again put this cooker on the flame for 7 minutes so that all sugar syrup get injected into these paneer balls. 18. After 7 minutes take out these paneer balls from cooker let it cool down. and Now your tiranga chum chum is ready to eat. 20. You can also coat it a silver layer at the top. and put small cutted pieces of almonds on the top.